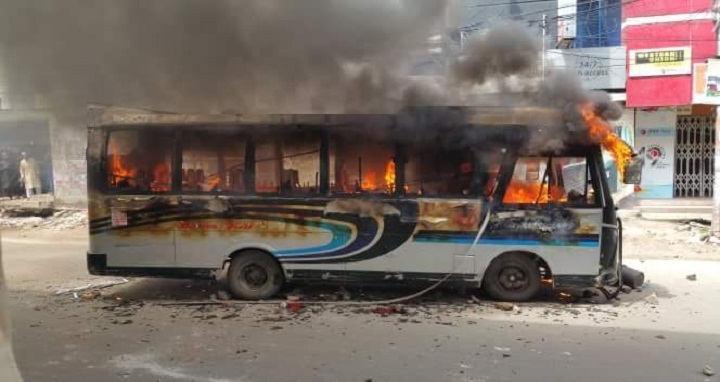 Dhaka, 3 August, Abnews: People set a bus on fire after it hit a motorbike, leaving a motorcyclist dead and a pedestrian injured at Moghbazar in the capital on Friday afternoon. The deceased was identified as Saiful Islam Rana, 30, son of Shahjahan of Goran and head nurse of Moghbazar Community Clinic. Tanharul Islam, an official at Fire Service and Civil Defence headquarters, said the ‘SP Golden Line Paribahan’ bus hit the motorbike while the it was getting down from Moghbazar flyover around 1:35pm, leaving Rana and a pedestrian injured. The injured were taken to Dhaka Medical College and Hospital where doctors declared Rana dead around 2:15pm. Local people turned furious after the road crash and torched the bus. On information, a firefighting team rushed in and doused the fire. Meanwhile, students from Siddheswari University College blocked the Mowchak-Moghbazar road after the accident. Later police removed them from the area.